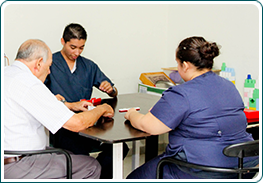 Deliver assisted elderly care for adults with limited economic capabilities, offering a place where they can have a dignified way of life, in a healthy and comfortable environment, improving their overall physic, psychological, spiritual and social development, through socializing within our community. Casa de Retiro Luis Elizondo should be; an institution that offers integrated care and residence to the elderly, which will have world-class treatment. It will collaborate and advice similar institutions in the planning and managing their services. All with the commitment to promote and spread the respect and dignity that elders deserve. Offering our residents periodical physical health and psychological evaluations, providing services according to their particular needs. We offer different activities that enrich their spiritual life, and give them the opportunity to reach peace, preparing them for their eventual encounter with God. Through diverse entertaining programs we promote socializing, engaging in occupational activities to promote the happiness and joy in life through out our community. Promoting activities and decision taking that make them feel active, motivated and worthy. Fund raising programs finance most of our day to day needs. This allows us to us to subsidize the services charged to our residents. We accept cash or non-cash donations rendering official deduction receipts.